Warnie’s Fantasy spin on every movement of the trade period. Projected prices are based on an approximate magic number of 7150 (an approximation based on last season’s number) which also assumes that the salary cap will be around $12,800,000, close to the official AFL salary cap for 2019 (we don’t have official confirmation at time of writing). Discounts have been applied following last year’s formula where appropriate. LATEST UPDATE: Wednesday October 17, 9:10pm. FANTASY VERDICT: The final deal of the trade period was a big one. Rumours of Beams wanting to head back to Melbourne – specifically Collingwood – appeared mid-season. They went away but a few minutes before deadline, the trade was made official. Beams is the biggest Fantasy stud of all of the moves of the trade period and has some impressive numbers next to his name across his career, but especially as a Pie. In his fourth season in the black-and-while, Beams averaged 116.4 from 21 games. In that season he scored 74, 93, 85 in his opening games (after being a late out in round one as a few would remember) then then go under 110 three times for the rest of the year. It was an incredible season. Things will be different as a 28-year-old and a different looking midfield, but the Pies are the highest scoring Fantasy team of the last couple of years and I’m sure the points will flow for him alongside Treloar. Taylor Adams probably suffers slightly and Sidebottom may end up playing a bit more forward while Pendles will be more of a role player as we’ve seen at times in the last couple of years. If Beama was on your radar for 2019 before the talk of the trade, then there is no reason why you’d take him off your shortlist following the trade news. Beams has a Fantasy game about him and will be part of the premium discussion during the pre-season and throughout the season proper. TOP 8 MIDFIELDER. FANTASY VERDICT: Hello Newman! Some are throwing up that this could be Titch-like. A ball-magnet who is out of favour with Horse at the Swans, racks up massive numbers in the NEAFL and will thrive after being traded. Hopefully he has defender status after being MID only this year… but played a lot off the wing (although his heat map looks promising). Newman scored five tons in his first year of playing senior footy and was the 2017 Fantasy rookie of the year. Who can forget him being dropped and coming in as a late inclusion for 135 points after many – including me – traded him out. NEAFL averages for the last four seasons read 91, 112, 116 and 131. With opportunity that awaits at the Blues, there’s plenty of upside but as a MID only, not sure you’d be jumping on him until we’re across where he fits in at the Blues. ONLY IF HE HAS DEF STATUS. FANTASY VERDICT: As a Bombers supporter, I’m pretty stoked about this. Firstly, looking at Shiel’s Fantasy value, there is some there. Priced at 89 when he’s gone at 98 in his seven year career (four times over 90), he’s played all but two games in the last three seasons. Shiel doesn’t have a huge ceiling. Over the last four years, the 25-year-old averaged in the mid-to-high 20s for disposals, but only around 3 marks and 3.5 tackles per game. This is what he needs to lift to boost his Fantasy scoring. Joining former team mate Devon Smith, Shiel will boost Essendon’s engine room paving the way for Zach Merrett to be one of the best underpriced premium buys of 2019. Merrett will be priced at 101.5 after two seasons of 117+. BUMP HIM UP YOUR DRAFT ORDER AND LOCK IN ZERRETT. FANTASY VERDICT: Only a small discount will be applied to his 68 average from last year, meaning he is going to be priced fewer than 10 points less than his best; 73 in 2014. Colyer has had a few injury issues over his career and been a fringe player at the Dons. I’m not sure a change in club is going to see enough of a spike in the 27-year-old’s scoring to consider. PASS. FANTASY VERDICT: Mostly irrelevant for Fantasy. Roughead’s has averaged around 68 in the last three seasons and that’s about where he’s at. His VFL numbers were great this year, going at 97 from his seven matches. PASS. FANTASY VERDICT: The 25-year-old former Bulldog has made his way north to the Lions to add to their defensive stocks. Adams is a 192cm key back who has averaged 67.9 over his three years and 27 games.While he was a handy cash cow a couple of years ago, there’s not a lot of value in him for the upside that we could see from him. PASS. FANTASY VERDICT: Tassie lad Jacko hasn’t set the Fantasy world on fire with 2015’s 19 games at 66.5 his best of his five year career. The 24-year-old heads to the Swans and you think he’d be down the pecking order to play in the backline (off half back?) which will push the likes of Callum Mills up the field. Realistically, he’s going to still be a fringe player at Sydney. Thurlow’s VFL numbers, playing a lot of games through the midfield has seen returns of 84 and 85 averages. In the NEAFL he probably averages 150. UNLIKELY TO BE AN OPTION. FANTASY VERDICT: Trades are flying thick and fast now. I don’t need to tell you much about a bloke that is going to be irrelevant. Six games in his second season (2013) for a 66.8 average was his best… but really, he’s been in the 50s for the last four years, with last year’s return a shocker which may make him underpriced, but you’re better off getting a rookie. PASS. FANTASY VERDICT: Unfortunately KK played just eight games for his career worst average (67.5), therefore his discount comes off his 2017 average which was his career best (85.8). While the 6% knocks him down to being priced at less than 81, it’s probably not cheap enough considering his battle with concussion issues and the unknown of coming into a new club. Very capable of averaging in the 80s, KK will be draftable, but it’s a risk I wouldn’t be taking. LOW ON WATCHLIST. FANTASY VERDICT: When I thought about May, I didn’t actually realise that his numbers were solid – when thinking Draft – from the last two seasons. 77.3 and 75.5 would be enough to hold down a deeper draft defensive spot, but he has played fewer than 19 games in every season of his eight year career. The Dees will love having May in their side – especially as they were tested a lot this year with Lever out with an ACL and having to try a few different things. Maybe May helps out Hibberd’s numbers. Not really an option to be thinking about. YEAH NAH. FANTASY VERDICT: He’d been a 67 guy across the last three seasons at the Giants where he has only missed 10 games. Lobb won’t have the same appeal as he did this year when he was looking to be the main man in the ruck for the Giants and looking to add RUC status for that handy RUC/FWD dual position eligibility. It’s funny to look back thinking he was underpriced but his output ended up being pretty similar to the year before at the end of the day. UNLIKELY TO BE RELEVANT. FANTASY VERDICT: It’s be a big call to start with Hogan at a new club, which is much worse, priced at 89. As a key forward, scoring can be very sporadic – as outlined by his season that saw seven scores under 70. On the flipside, of the nine tons to his name, six were 110 or more (all where he kicked 3 or more goals) with a top score of 133 (5 goals). It’s no secret that he a) wanted to get back to WA and b) is a definite need for the Dockers. This should equate to a good season, but needs goals to help post big scores and Freo maybe won’t improve enough to help in this department. Hogan may however get some of that extra time up the ground if Lobb and McCarthy can work well in the forward 50 together. This is what could get me excited. WAIT ON HIM UNLESS WE KNOW HE’S NICK RIEWOLDT. FANTASY VERDICT: I was ready to put a line through Neale as a Fantasy option for my team in the future. Thinking he’d have the opporunity to hit that 111.1 he did in 2016 and his durability – not to mention a JLT 154, Neale was an early lock for me last pre-season. He was all kinds of average. Not in a bad way, just he would hit his 100 mark and that was pretty much it. I remember following scores where he was on track for a beast score, but still ended up with 100. Even with Fyfe missing a few games, Neale didn’t smack out the numbers we were expecting. With just four scores over 110 (that was 138, 117, 127 and 113 spread across the year), there weren’t many occassions he showed a high ceiling despite averaging over 30 disposals for the season. A kick to handball ratio of 11.4 to 18.9 (1:1.6) was his ‘worst’ of his career. Looking ahead, Neale heading to Brisbane will be interesting. Fantasy points flow at the Lions and Neale should improve his output, but to get a read on this with Beams’ potential movement will be a wait and see. We’ll discuss this more on the podcast in the next couple of weeks around the Lions and Zorko for example, but there will be a few extra points for some of the Freo MIDs you’d think. CONSIDER – SECOND ROUND DRAFT PICK AT LATEST. FANTASY VERDICT: Mayes has some great NEAFL numbers next to his name with a 91 average from his 13 games in the magoos this year and an average of 132 from his four games in the two years prior. At AFL level, Mayes enjoyed his best season averaging 80 in 2017 where he posted 5 tons, adding to the two he scored in his debut season. It’s hard to see the defender doing much better than the 70 he’ll be priced at. PASS. FANTASY VERDICT: The MID/FWD comes in underpriced in 2019, around about 10 points less than his PB average of 92 in 2017. Wingard’s 2018 average doesn’t look at good as those who selected him throughout the bye rounds due to his start to the season that saw a 92 in the opening round and then 73 being his next best score – littered with some 50s and even a couple of 40s. In round 12, equal winner Fantasy Classic Selby Lee-Steere brought him in, off the back of a 49, for a 121 to enjoy four tons in the next five weeks to average 96 in his last 12 games. Role will be interesting. Hawks have said he will run through the midfield (a must for his Fantasy scoring), but we will most likely see him still play as a half-forward that has seen him awarded a spot in the All-Australian team. As a FWD, Wingard could be a top line player and definitely on the pre-season watchlist due to Hawthorn being a better Fantasy team to play for than the Power. ONE TO CONSIDER. FANTASY VERDICT: Runner up in the 2017 NAB Rising Star, Burton enjoyed a stellar sophomore season to average 84.4 from 20 games. Plenty of Draft coaches were screwed by an early drafting of Burton this season who averaged just 62, including four scores under 50 to start the year. Port Adelaide doesn’t necessarily need a Burton-type and their scoring is something that has thwarted the scoring of even the best Fantasy players. Underpriced, but we’ll need to tread carefully… take a later round punt in Draft, but as for Classic, maybe we can wait to see how he is used. WATCHLIST. FANTASY VERDICT: Once upon a time I thought this bloke would be a good option for us. It was heading into 2016, the first year post the bloody sub vest. In 2015, his third season, Duryea scored three tons (109, 111, 118) in his 18 H&A games and had 92, 110 and 98 in Hawthorn’s three victorious finals appearances as they won the second of their three-peat flags. That average of 79 was, in my opinion, way unders considering he wore the vest four times and his finals series was giving me all of the right signals to pick him up. He dropped one ton from his 21 games the next year (only three games over 85) to average 69. The 27-year-old DEF/FWD may have a spike in points with the Dogs and creep in to average the 70s for the second time in his career, but it’s a big no from me. FOOL ME ONCE. FANTASY VERDICT: The Hawks got a steal if they can see Scully close to his best… which will include playing. From all reports his ankle, which he horrifically injured in round two this year, could be an issue moving forward considering the setbacks he has had – including more surgery and more metal being inserted. Scully is expected to start jogging in 5-6 weeks. The former No. 1 Draft pick averaged 79 and 77 in his two seasons as a Dee and improved to 84 and 96 in 2015/16, his fourth and fifth seasons as a Giant. If fit, there’s no doubt that his return will be more than the 60 points he’s priced at, but selecting the elite two-way runner may not be a risk worth taking. UNDERPRICED BUT HAS A LOT OF QUESTION MARKS WITH HIS BODY. We've reached a deal with the Giants to bring the midfielder back home to Melbourne. FANTASY VERDICT: The small forward is a cousin of Micky O and only managed two games at the Tigers. Racking up just eight disposals in each of his matches, we’re not going to see a whole heap from the new Crow and will be facing a battle for a place in the 22. Stengle averaged 64 and 69 Fantasy points in his two years in the VFL. PASS. FANTASY VERDICT: GHS’s discount will be applied to his highest return in his 49 game career. He’ll be priced at around 60 points, which is a lot less than the 91, 98, 91, 98 and 80 he’s averaged at VFL level in the last five seasons. In his first game this year, coming in as a late inclusion in round five, Horlin-Smith kicked two goals to go with his 24 disposals, five marks and eight tackles for a career high 123. From there he was concussed for 20 the next week, came back into the side a fortnight later for 65 and then 44 the next week before being dropped again. GHS will walk into the Suns’ 22 and is odds on to produce the best numbers in his eighth season. UPSIDE, BUT PROBABLY NOT ENOUGH – WATCHLIST. 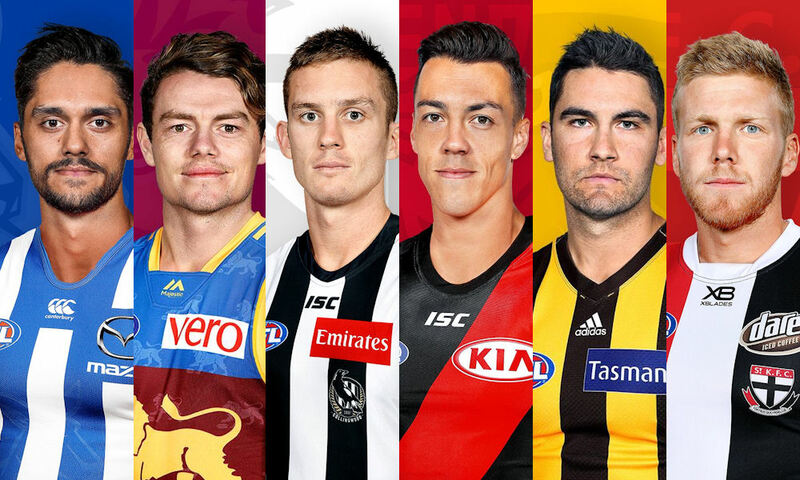 FANTASY VERDICT: Pretty much rookie priced, we’ve got to consider the 193cm defender who may get opportunity at Hawthorn with some holes that will need to be filled. Sounds like Scrimshaw didn’t buy into what he needed to as an AFL player, but if anyone can change him, it’s the Hawks. The 20-year-old played four games towards the end of 2017 for scores of 42, 46, 47 and 25. In the NEAFL he’s played 28 games in his two seasons at an average of 67 (19 disposals, 5 marks). BENCH OPTION. FANTASY VERDICT: Cops a discount for his six games, but won’t be as underpriced in Fantasy Classic as other games as his discount will be applied to his 2017 average of 98. This average was the second highest of his career behind 2016’s 105.2. There is no doubt that Hall is a ball-magnet. When things are going his way, we’ll see massive scores. He’s a bloke that has been criticised heavily for his lack of defence and following team rules/structure. Remember when he polled three lots of 3 Brownlow votes to start 2016 and was dropped six weekly later? We spoke to Rocket Eade on the podcast last pre-season and he said players came to him to have him dropped. Hall was dropped early this season, a couple of weeks after copping the Bailey Banfield tag that held him to five disposals and a paltry 14 Fantasy points. This, together with his season ending shoulder injury for 36 in round 11, brought his average right down. In his last couple of games he was switched to ply his trade as a running half-back for scores of 102 and 115 (23 and 29 disposals with 8 and 7 marks respectively). Hall has three 150 plus scores to his name in the last three seasons and that 2016 season saw lowest scores of 59, 86… and then 94, meaning in 14 games he scores 94 or more (11 of these were tons). Priced in the high 80s, I don’t think he’ll be cheap enough to go there in Classic with other cheaper/midpriced options, but you could get a great return with a later midfield pick in Draft considering the upside. Click here to read a great take from a North Melbourne supporter. CONSIDER AS A LATE ROUND DRAFT STEAL. FANTASY VERDICT: Slightly underpriced with his small discount, but it’s taking him to be priced at around 61 when he’s pretty much averaged 67.5 in his last three seasons. Definitely will have more opportunity to build on the 8 and 7 games he played in the last two seasons (he played 22 games in 2016 – his third season) to play that forward role which was vacated by Dahlhaus. Lloyd’s only Fantasy ton (107) came in his first ever game, 107 versus Collingwood thanks to 22 disposals and three goals. He scored 95 in round eight against North this year, but prior to that, has failed to score more than 88 in his 57 game career. PASS. FANTASY VERDICT: We were all keen on Setterfield this time last year and were ready to see how he went in the JLT Series as he was set to be part of GWS’ 22 for round one. An ACL injury in a practice match versus the Swans on the eve of the pre-season games ended his hopes of playing in 2018. He’s recovered well and will commence full training early in the new year and is on track to play in round one. At the Blues, he’s got to be a sure thing to be suiting up in his new colours in March. Why are we keen? He averaged 110 from 7 games in the NEAFL in 2017 and was named as a MID/FWD for this year. LOCK AND LOAD. FANTASY VERDICT: What is he thinking? Surely he waits it out at the Roos until Goldy departs… a year? Maybe two? Anyway, he must have been sold more than being Max Gawn’s understudy at Melbourne and playing for Casey each week which is the worrying thing. Is Max no longer a solo ruckman? This will be a huge thing to watch over the pre-season. Firstly, Gawn can’t be a starter in Classic… and secondly, what happens to his Draft value – prior to this he was looking at being a first round pick with Grundy. Anyway, back to Preuss. The 23-year-old had some nice returns when he broke through for his first eight games of his career last year. A pair of 105’s in game 2 and 3 saw us make a few dollars on our bench with some coaches selling the farm making him a starter. His second game was after being dropped – and coming in as a late replacement for Goldy. Not a bad score coming in to replace the big fella. In the VFL, Preuss has averaged 110 and 103 in the last two seasons. OH NO… FOR MAX THAT IS. FANTASY VERDICT: Tyson will be priced more than 15 points cheaper than his best Fantasy season; 2016’s 92.9 from 21 games. That wasn’t his only year he’s hit the 90 mark, back in his third season, Tyson played all 22 games for an average of 90 and almost got there in 2017 with an average of 89.6. Now, the issue is that these aren’t premium numbers – even at his best. There’s upside, but is it enough? A 15 point jump is nice for a stepping stone but there will be other options – even from this trade period like Hanners, Miles – that will be cheaper for potentially the same, if not better, average. This year he failed to score a ton even in a high possession Dees line up. There will be increased opportunity at North Melbourne but they have a lot of change coming so it will be hard to judge. If he hits 90+, though, Tyson will be Draft relevant but I wouldn’t be taking him at that average point with the unknown about the Roos’ bolstered midfield. UNLIKELY TO BE AN OPTION AS A MID. FANTASY VERDICT: A couple of injuries limited the forward’s games this year, playing five in the AFL and five in the VFL. Even with a discount, he is priced higher than this year’s return due to taking the greater of his last two season’s averages to apply the discount to. With this being said, Kent is priced 10 points below what he was able to achieve the two seasons prior – just a touch under a 70 average. While I don’t see him being an option, even with greater opportunity, Kent’s first two games this year produced scores of 86 and 93 thanks to three goals in each of them before a thigh injury before half time on 30 in his third game. On his return to the seniors in round 22, he scored 77 before 2 in the final round before an early game AC injury. Kent’s VFL averages have been positive, despite limited games/data. In 2014 he averaged 97 and 2017 he averaged 95. UNDERPRICED, BUT A PASS. FANTASY VERDICT: When I floated Hannebery as a 2019 option a few weeks ago, some were on board while others were 100% steering clear. Hanners had his worst season since his 7 game, 46 point average in his rookie year (2009). In recent years, he’s gone at 97, 111, 108 and 94 to show that his best is well an truly better than the sub-60 average he had this year and will be priced at. At worst, he probably goes at 90 with a full pre-season under his belt considering he’ll only just turn 28 as the season starts. For the Saints to be paying him $800K a year for the next four seasons either means they’re desperate, or they have faith that the injuries from the last two years are behind him. I’m hoping it’s the latter although when you look at his top two scores of 2018 being 82 and 92, then I can see why people are keen to steer clear. BARGAIN IF FIT. FANTASY VERDICT: Don’t get too excited about bloody cheap Faz at the Blues. While he gets the 27% discount for only playing one game, the second quarter injury that saw him with two disposals and just 12 points to his name isn’t going to make him basement priced, he will have the discount applied to 2017’s average. Yes, he’s still cheaper – priced at 50.6 – but in his eight seasons, he has only twice averaged over 70… and they were only just (72.5 in 2012 and 71.5 in 2015). There’s 20 points of upside, but that is definitely a best case scenario – and not enough for Classic as you’d be better off with a rookie… and in Draft, there would be players with much less risk to take ahead of him at his draft point. PASS. FANTASY VERDICT: With Lycett off the the Power and NicNat’s ACL keeping him out for most of next season, Hickey could be the go-to man for the Eagles, potentially with Vardy for the start of the season as Lycett and Vardy played together for the back-half. Hickey has averaged in the 70s in four of his last five seasons averaging mid-20s hitouts and is likely to drop those sort of numbers again as the solo ruck, and then a likely decline when NicNat is back. A potential bench option in Draft – even if you waited on your ruck and could stream (ie. play horses for courses) with him and whoever else you grab. UNLIKELY TO BE A SERIOUS OPTION. FANTASY VERDICT: I was big on Ryan Clarke for this season. It was mostly for Draft, I was expecting him to average over 80 – and subsequently got burned with the 70 average, just a couple of points better than 2017. My keenness was off the back of his end to to the 2017 season where he averaged 90 in this half-back role. Clarke played that this year but didn’t produce those same numbers. Depending on how he is used – the Freako said he should be in the guts for the Swans – Clarke is someone who should be draftable and should improve his average. Should. HMMM… SURELY A WATCH. FANTASY VERDICT: I wont wast too much time here but Gary Rohan would have to be basement priced to consider. While his average of 43.4 is his lowest since an injury affected 3 game run in 2013, his best return of 60.7 (last year) doesn’t actually make him that underpriced. NOT FOR ME. FANTASY VERDICT: Three seasons in the 70s, then 83 building up to his PB of 92 this year, Polec is trending in the right direction but isn’t dumping the numbers that make us any way excited about his Fantasy future. That average of 92 only included six tons, including 132 and 156 which has definitely boosted his overall average. At present, he’s a mid-80s guy at best, however he has been playing for Port Adelaide who aren’t exactly a Fantasy friendly team. You can’t knock his consistency, his season low of 68 was one of only six scores under 80. PASS. FANTASY VERDICT: Pittard had a frustrating season at the Power playing just 11 games. His best Fantasy return was in 2016 where he played 22 games at an average of 82.2 which puts him in the mix as a starting defender in Draft. North Melbourne will have a bit of movement this off-season, so we need to wait an see. Polec’s kick to handball ratio is one of the best in the league and if he can get his hands on the pill via a few more marks, then he could be relevant. Probably a pass in Classic unless you’re really keen on a mid-pricer down back, but keep an eye on in Draft as someone you could get for unders with 10-15 points of upside now that he’s away from the Fantasy point killers Port Adelaide. PRE-SEASON WATCHLIST. FANTASY VERDICT: McGovern is a great pick up by the Blues. The former Crow has played three seasons at senior level with his third producing his best Fantasy average. While he dropped some nice scores of 93, 87, 114 and 91 throughout the season, they were weighed down by a handful of 40s and 50s. Will have some jobs to do and for Classic, I think he’s going to drop similar numbers at his new club. PASS ON KPPS. FANTASY VERDICT: The 181-cm medium forward kicked 31 goals for Sturt this year. He remains in SA (originally he’s from Hall Creek in northern WA) and could be used by the Crows next year. The 23-year-old’s five most recent scores in his first season in the SANFL were: 57, 51, 91, 56, 70. McAdam needs to be monitored during the pre-season as a 23-year-old mature aged player. WATCHLIST. FANTASY VERDICT: This season was the first that Lycett played 22 games. Prior to that, his best return was 20 games at a career high average of 80.1. Obviously he has been sharing ruck duties at West Coast and will be doing the same at the Power. Paddy Ryder’s value drops and you couldn’t say Lycett’s increases with this move. With only eight Fantasy tons in his 71 games, it’s a big pass for me. ONLY IF YOU’RE PLAYING TWO RUCK DRAFT LEAGUES. FANTASY VERDICT: The former Gold Coast captain has made his way to the Tigers. From a Fantasy Classic perspective, it was great that he got to 10 games so that he is priced at 67, his lowest since 2013. In 2016 Lynch went at 86.1 from 22 games, a PB, and backed it up with an 80 average the following year. Hampered by a knee injury this season, there is an argument that there is up to 20 points of improvement in him based on his best season. The Tigers are a low scoring Fantasy team, but things will need to change with a different forward set up that will see Lynch as the big man with Jack Riewoldt. No doubt he is value, but you’d want to back him in to hit that 85 or so mark to be worthwhile – but as a stepping stone and if the ducks line up, could be an underpriced forward to start the season with. I’m backing Lynch to average over the 80 figure and will rank him accordingly for Draft. UPSIDE, BUT MAYBE NOT ENOUGH. FANTASY VERDICT: The Blues had access to South Adelaide’s Kreuger due to the bonus state league player allowances they were given. They’ve ontraded him to help grab some bargaining power for the McGovern trade. The 19-year-old’s most recent SANFL scores have been 47, 58, 67, 57, 88, 60, 47… you get my drift. Kreuger is a 196-cm key forward who can play back and is most likely playing in the Cats’ VFL side, at least to begin with in 2019. YOU’D THINK HE’S UNLIKELY TO GET OPPORTUNITY. FANTASY VERDICT: If there’s a bloke who could rack up points in a VFL standard team, then it’s Anthony Miles. The former Giant and Tiger had three seasons at Richmond averaging 86 or more, but it’s his VFL numbers that are most impressive. In 2014 he went at 110, 2015 played all 22 AFL games for the Tiges at 87.7, in 2016 averaged 105, a whopping 123 from 14 games in 2017 and then this year 105 from his 16 appearances in the magoos. You’d think the 26-year-old will play all 22 games for the hapless Suns and add to his 19 tons from his 69 career games in his new colours. MID-PRICED LOCK IF FIT. FANTASY VERDICT: Hasn’t set the world on fire, but you could probably say the lack of opportunity has been a factor for the DEF/MID. In 2016 he played a career high 11 games for an average of 61.7, but has only added 10 more appearances in the last two years. In the VFL, Ellis has gone at 89 and 85 the last two seasons. A discount and the added opportunity that he’ll get at the Suns will make the 22-year-old an option priced at 36 – which is less than the top end rookies. PRE-SEASON WATCH. FANTASY VERDICT: As Roy affectionately referred to him as Linc the Stink, the Fantasy scores to expect from the soon-to-be 25-year-old Cat are a bit smelly. His best season return was 2017’s 55.3, but that was from just three games. He averaged a point fewer in the prior season which he finished with 17 games. A move to the Lions could see him play in the midfield and as a pressure forward according to David Noble, but I’m not sure if two scores in his career over 80 is enough to contemplate him even if he is likely to be priced at 41. Maybe averages somewhere between 60-65 at best. ONLY IF WE’RE DESPERATE FOR A HIGHER END FORWARD CASH COW. FANTASY VERDICT: I’ve been a big fan of Dahlhaus – probably due to being a previous owner and enjoying his 22 games in 2015 at an average of 97.3 – but he is trending backwards despite the Bulldogs having a high possession game. While playing as a true MID/FWD, from the naked eye, his splits would be more time up forward, probably suffering from the rotating options for the Dogs’ midfield spots such as Josh Dunkley getting more time in the second half of the season. Dahlhaus’ return in 2018 was his worst since 2013. While he has enjoyed some great Fantasy numbers in his past, you’d think that MID/FWD split at the Cats would continue to keep his numbers down due to their beast midfield. TOO FAR DOWN THE PECKING ORDER. FANTASY VERDICT: Injuries (and brain fades) have played a part in his lack of games across his eight years at the Tigers. Conca played the majority of the season, producing six scores over 90, only to miss games through a broken ankle early in the round 15 game against the Swans. This arguably makes him underpriced as he left the field on just 5 points. Take out that score and he’s comfortably had an 80+ season which would rank as his best to date. Mostly used in defence, Conca relies on tackles to get his numbers up. Providing he’s fit, he’ll have greater opportunity at the Dockers and should be an increase in numbers. IT’S A NO IN CLASSIC, BUT A DECENT LATE ROUND STEAL IN DRAFT. Miles is interesting, might even be a unique with the likes of Hanners and Scully set to be around the 430k mark. I want this Shiel deal to get done! Excited for the Dons… and Zach Merrett in Fantasy (not that he wasn’t already an underpriced lock). Come on Dylan, join Devon.